Customise this branded Heart Shape Clip with your business name or logo for an eye-catching giveaway your prospective customers can put on their office desks. With a base in a translucent rose-coloured acrylic, it comes fitted with a flexible wire with a clip on its other end. Perfect for targeting housewives in a home decor exhibit, it also makes a great party favour for home-based workers. Your logo can be printed on the front - please check for any other positions. 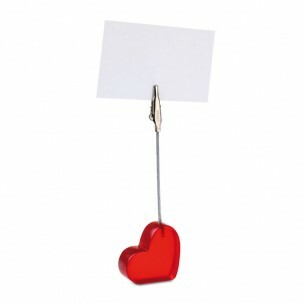 The heart shape clip is made from plastic and can be purchased in red . Our desk item items are printed in up to 2 colours via pad print, which is a technique suitable for almost all artwork and shapes.